i just got the biography of misia out of the library, so i'm working on that, and also another post about another 'superstar' of the time, but in the meantime i wanted to mention that several weeks ago princess haiku mentioned she'd seen a post that might interest me. 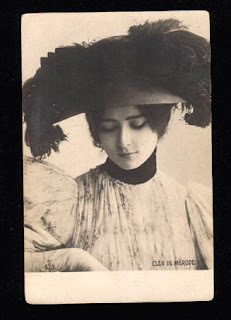 she sent me over to celestine musings where there was a post on Cléo de Mérode. since she was directly aligned with the era that interests me the most, i googled her--or more specifically i google imaged her. and got two truly coincidental surprises. 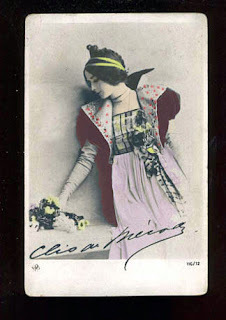 then, as i googled further (a search that the print was indeed cleo), i came across this photo. in 1990 i had bought a set of books printed in japan called 'la collection 1990." on the cover of the volume featuring photographs of women of the era by reutlinger is this photo. i have stared at it often, finding the sheer incongruity of the combinations delightful. of course, it's cleo too. somehow i just have the feeling we will meet again.